I haven’t shared much of what I’ve been making for myself. I wear me-made clothing everyday, but getting pictures seems to be a challenge for me. I often write my blog post as I’m sewing so I can keep track of fitting changes, so I have many drafts sitting without pics unfortunately. 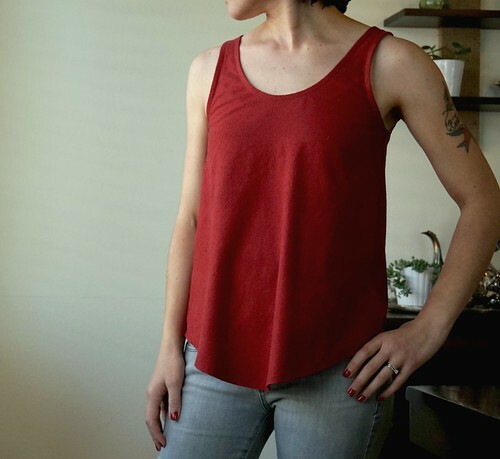 This is the Basics Tank from the Cali Faye Collection. I’ve read good things about this woven tank pattern, so I decided to go for it. Who doesn’t need more basics in their wardrobe? 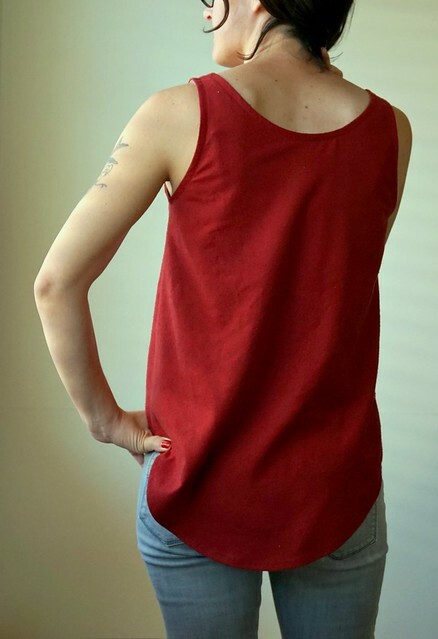 Also, the bottom hem keeps it from being like every other basic tank, and the neckline is perfect to show off necklaces. Maybe I need to make some more jewelry! I do also love designing beautiful jewelry. Anyway, I used a silk blend fabric that was a remnant from Stonemountain and Daughter. Their remnant bins are full of a variety of some pretty great fabric! This one is soft and has a very unusual “knobby” texture. I figured it would have a lovely drape, and I like having this solid color to pair with sweaters when it gets cooler. 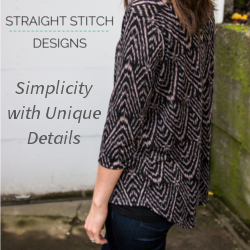 It was very simple to sew and would be a great pattern for beginners. It calls for bias tape to finish the neckline and armholes (you can tell I took my time and did the neckline properly, then raced to finish the armholes! ), and there are no darts. The back hemline is a bit dramatic, so I might shorten it on my next version. Next PostNext An Outfit for Fall…With a Side of Ghosts!